Mark Holley began playing trombone at the age of 13 in his hometown of Coral Springs, FL. After quickly finding a joy for music Mark decided to attend the Interlochen Arts Academy in Interlochen, MI. This institution set the stage for Mark’s career path and led him to receive a Bachelor’s degree in music from DePaul University in Chicago, IL and a Master’s Degree from Rice University in Houston, TX. Mark has taught and performed all around the United States, Canada and Europe. During his time in Chicago, Mark played with the Axiom Brass Quintet, Illinois Philharmonic, Chicago Trombone Consort, and the Dalniente New Music Ensemble. Currently Mark holds a position with the Houston Grand Opera as second ttrombone, and frequently plays with the Houston Ballet and the Houston Symphony. 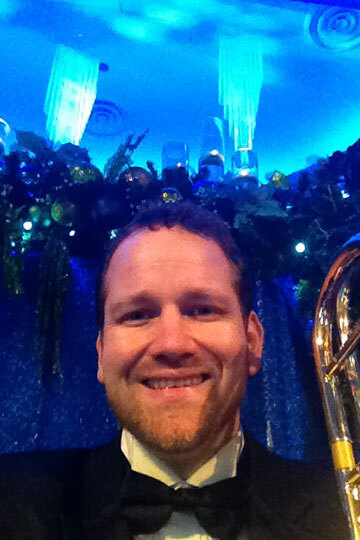 As an active educator in music, Mark also keeps busy running a low brass teaching studio in The Woodlands. Major teachers Mark has studied with include Mark Fisher, David Waters, Tom Riccobono, Jay Friedman, Charlie Vernon, Floyd Cooley, and Vern Kagarice. Activities outside of music include weather watching, camping, discovering Houston's great food, biking, and trying to figure out what new television series to get hooked on on Netflix.